already 40 million millennials in the workforce. through Millennial eyes...and to help employers decode how to leverage the abundant creative energies of their cubicle-dwelling populations. What the data and feedback point to a generation primed to give their all, but calling for meaning, mentorship and meritocracy in a workplace that can channel what they bring to the table. pressure-cooker educational experience and empowering technology -- and you have a newly minted high octane workforce in the wings. What could be misinterpreted as "self importance" is a deeper sense of having many new ideas and wanting to contribute, as well as a desire to have their tech skills and savvy tapped by senior managers. when we leverage generational creativity it's a win-win for the company, the workforce and the consumer. corporations toward creating an environment where M’s thrive, and so their power can be harnessed into a real competitive advantage. • Nearly 9 in 10 Millennials want their workplace to be social and fun. • 93% want a job where they can be themselves. • A full 70% of Millennials say they need “me time” at work versus just 39% of Boomers. work-life smoothie. The boxes and all turned into one big box, called living. style, a full-blown outfit shift after work. 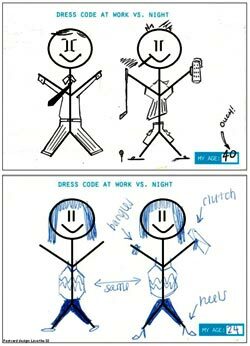 Our Millennials drew almost the exact same image of themselves at work and play...they just added bangles and hairspray to the outfit to get it ready for nightlife! • Career 2.0 is about first inventing a job, then doing it…. • 66% of Millennials agree they want to invent their own position at their jobs. the youngest employees who are frequently called into brainstorms with the C-suite to help imagine the company’s future products? The job description of the future is a co-creation with the employee, an ongoing innovation in itself that responds to the shifting needs of the game and the passions of the players. Reid Hoffman, co-founder of LinkedIn has described this as a state of 'permanent Beta', a state that's native to Millennials. Or as one participant in our study said “I don’t so much want a boss, more of a Yoda.” Raised in a very different nonhierarchical parenting paradigm, where Boomers see “The Man” and Xers see “authority hurdles,” Milennials see friends, life coaches and guides. • Nine out of 10 Millennials want senior people in their company to listen to their ideas and opinions. said, is the purest form of inquiry. another way. In many ways, this generation is uniquely equipped to see around corners and over the horizon -- and that’s just the kind of foresight that is worth its weight in silicon. 1 comment about "Turning On The "No-Collar" Workforce". Ben Stone from Kidkraft Toys, October 19, 2014 at 5:11 a.m.
everyone gets a trophy. They were never taught how to reach out to others. In discussions such as these, the boomers and their millenial children are often pitted against one another. They have a certain complicity. Generation Xers are forgotten in this discussion; however, they are the generation that has solid work values, communication skills as well as a good grasp of technology.